Flagship Marine Engine Company was purchased from Brunswick Corporation in 1964 by Tom Fileman. Since the purchase of the company we have built the OwensYacht and Flagship line of flywheel forward engines in a varity of sizes. 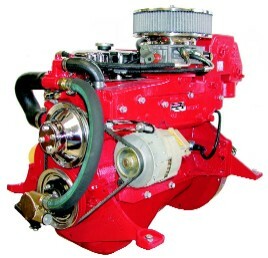 Shown above is of the first Chevy 427 cubic inch marine engine built in 1969. From then to today, Tom is still involved with all facets of Flagship's engine business. Although the models of marine engines today has changed, our experiences with inboards runs through several generations of the family. We have been building GM marine engines since 1955, a tradition that continues today in our facility in Florida. 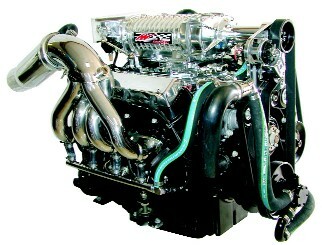 Our inboard models produce horsepower that range from 145 hp, 4 cylinder through our mighty 850 hp V8's. All production models come with a limited warranty. Plus Flagship Marine Engine is one of a select few who have the privilege of distributing GM's Marine Performance Parts and Base Engines. Our R&D Center has full machine shop capabilities with 2 fully operational Dynamometers, which compliments our complete customer engine rebuild center. Our Hi-performance inboard team has competed in both APBA / UIM sanctioned events and collected several World Championships, National Championships and APBA kilo speed records. At Flagship Marine we are a family of boaters, and because we are boaters, we know what it's like to have a failure, that's why we take the extra time and use OEM components in every product we build. Our Outboard experience spans a quarter of a century in remanufacturing EVINRUDE / JOHNSON replacement powerheads. Today, our association with EVINRUDE / JOHNSON Genuine Parts remains strong and will continue. We still remain the only independent remanufacturer that builds, sells, services, and warrants any (OMC) Bombardier EVINRUDE / JOHNSON produced replacement powerhead. The experience of our outboard group of experts totals over 90 years and includes several former OMC Master Technicians. This experience stems from major dealership service department experience, combined with 20 + years as a Senior Technical Representative / Service Department Supervisor from OMC's Technical Service group. When it comes to hi-performance our outboard experts have competed in both APBA / UIM sanctioned events and collected several World Championships and National Championships. Our experience for perfection is what drives us every step of the way. We enjoy boating and hope our customers do too. We want every customer of Flagship Marine Engine Company to enjoy using our products, and because of our experience we make every effort to make sure that happens.